I recently talked to Sanjay Uppal, vice president and general manager of the VeloCloud Business Unit. He shared with me where VeloCloud is heading, adding that it’s all possible because of the complementary products that VMware brings to VeloCloud’s table. It all starts with this architecture chart that shows the VMware vision for the network edge. The left side of the chart shows that in the branch office, you can put an edge device that can be either a VeloCloud hardware appliance or VeloCloud software running on some third-party hardware. Then the right side of the chart shows where the workloads are — the traditional data center, the public cloud, and SaaS applications. You can put one or more edge devices there and then you have the classic hub-and-spoke model with the VeloCloud SD-WAN on running on top. In the middle of the diagram are the gateways, which are a differentiator and a unique benefit of VeloCloud. Going back to the architecture diagram, there are two clouds in the middle of the chart. The left-hand cloud is the over-the-top (OTT) service run by VeloCloud. It uses 800 gateways deployed over 30 points of presence (PoPs) around the world. The right-hand cloud is the telco cloud, which deploys gateways as network-based services. VeloCloud has several telco partners that take the same VeloCloud gateways and deploy them in their cloud. “Between a telco service, a cloud service, and hub and spoke on premise, we essentially have covered all the bases in terms of how enterprises would want to consume software-defined WAN. This flexibility is part of the reason why we've been successful in this market,” Uppal said. Where is VeloCloud going with this strategy? Again, looking at the architecture chart, the “vision” pieces are labeled 1 through 5. Let’s look at each of those areas. Starting with number 1 on the left-hand side of the diagram, there is the expansion from the edge itself going deeper into the branch by crossing over a LAN or a Wi-Fi boundary to get to where the individual users and IoT “things” are. This approach uses the same VeloCloud platform to spin up compute at the edge, which can be either a container or a virtual machine (VM). The next piece, number 2 on the diagram, is 5G. At the Mobile World Congress, VMware and AT&T announced they are bringing SD-WAN out running on 5G. The idea here is that 5G should give you a low-latency connection and you get on-demand control, so you can tell 5G on the fly that you want this type of connection. Once that is done, the right network slices would be put in place and then you can get a connection according to the specifications that you asked for. Uppal continued, “What 5G allows us to do is to look at that underlay as not just being one underlay, but it could be several different underlays, and it's programmable so you could ask it for a type of underlay. 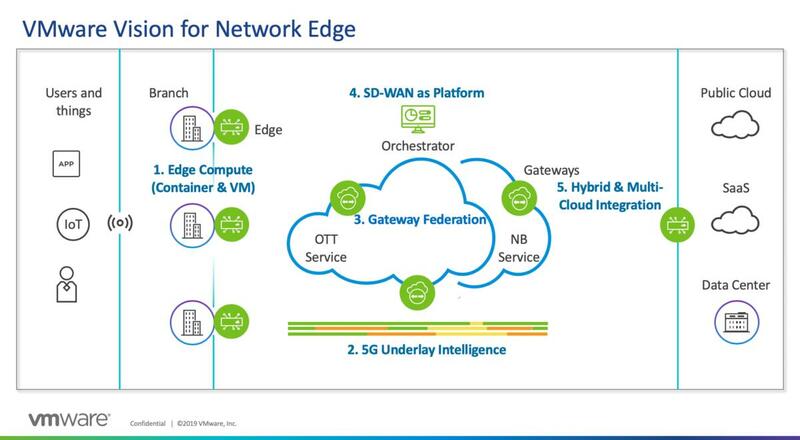 That is actually pretty revolutionary — that we would run an overlay with the intelligence of SD-WAN counting on the underlay intelligence of 5G. The third part of the vision is gateway federation, some of which is available today. The left-hand cloud in the diagram, which is the OTT service, should be able to interoperate gateway to gateway with the cloud on the right-hand side, which is the network-based service. For example, if you have a telco cloud of gateways but those gateways don't reach out into areas where the telco doesn’t have a presence, then you can reuse VeloCloud gateways that are sitting in other locations. A gateway would federate with another gateway, so it would extend the telco’s network beyond the facilities that they own. That's the first step of gateway federation, which is available from VeloCloud today. Uppal said the next step is a telco-to telco-federation. “There's a lot of interest from folks in the industry on how to get that federation done. We're working with the Metro Ethernet Forum (MEF) on that,” he said. The next piece of the vision is SD-WAN as a platform. 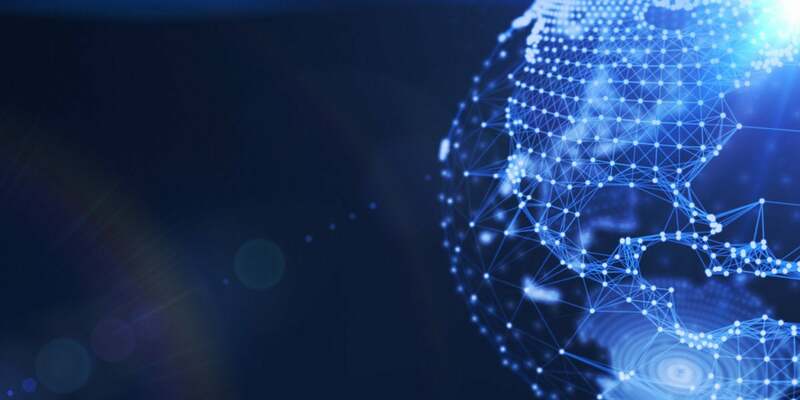 VeloCloud already incorporates security services into its SD-WAN platform in the form of virtual network functions (VNFs) from Palo Alto, Check Point Software, and other partners. Deploying a service as a VNF eliminates having separate hardware on the network. Now the company is starting to bring more services onto its platform. Two additional areas that VeloCloud is working on are unified communications as a service (UCaaS) and universal customer premises equipment (uCPE). The final piece of the strategy is hybrid and multi-cloud integration. Since its inception, VeloCloud has had gateways to facilitate access to specific applications running in the cloud. These gateways provide a secure end-to-end connection and an ROI advantage. Recognizing that workloads have expanded to multi-cloud and hybrid cloud, VeloCloud is broadening this approach utilizing VMware’s relationships with Microsoft, Amazon, and Google and offerings on Azure, Amazon Web Services, and Google Cloud, respectively. From a networking standpoint, you can get the same consistency of access using VeloCloud because you can decide from the gateway whichever direction you want to go. That direction will be chosen — and services added — based on your business policy.